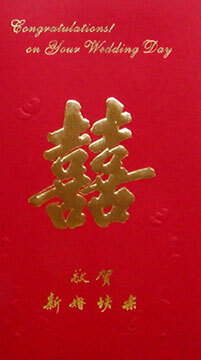 The story of "Ang Pow" (or "Red Packet", "Hong Bao" or "Lai See") dates back to the Sung Dynasty in China. A village called Chang-Chieu was at the time terrorized by a huge, evil demon, and no one was capable of defeating it. Not even their greatest warriors or statesmen. However, a young orphan, armed with a magical saber inherited from his ancestors, fought the demon and eventually killed it. The villagers were so grateful, the elders presented the brave young man with a red packet filled with money as a reward for his courage. Since then, the ang pow has become a part of traditional Chinese custom. Ang Pows are now used during Chinese New Year, Birthdays, Funerals (white ones), and of course: Weddings. Almost anything can be stuffed into an Ang Pow, from cash to checks, and even jewelry. In Singapore, the tradition is for guests attending the wedding to come bearing Ang Pows for the newlywed couple instead of gifts. A little congratulatory note is sometimes written on the back, and signed by the giver. Such nice details. Keep sharing such posts. I like attended wedding ceremonies and now the time has come for our own. We are super excited for the summer sunshine wedding ceremony. Most of the arrangements have been completed. The ceremony will be held at one of our favorite San Francisco venues.